AmpliTube 4 is a guitar and bass tone studio for Mac/PC that works as a standalone application and as a plug-in for your favorite DAW. AmpliTube recreates the entire guitar/bass signal chain from instrument to recording device, and does so in a very realistic and intuitive way. But it also does it in ways you never dreamed possible. If you’re new to using computers to get fabulous guitar tone, then you’re in for a treat. If you’re a veteran computer tone-master, well, you’re still in for a treat. 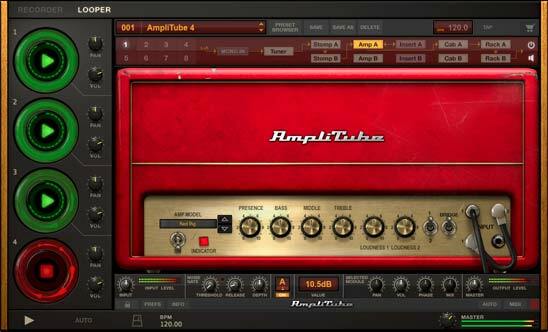 AmpliTube pioneered — and leads the way in — guitar amp and effects modeling, and AmpliTube 4 takes it to the outer edges of extreme hyper realism with intuitive familiar tools. Fasten your seat belt… let’s take a quick tour! The cab room now has 5 distinct customization sections: cabinet selection with size adjustment where players can choose the speaker cabinet they’d like to match to the amplifier, individual speaker selection where they can swap out individual speakers, mic selection and placement for finding the speaker “sweet spot”, room selection where players select the surrounding recording environment, and a mixer section that allows players to mix the levels of speaker mics, room ambience, direct amp signal and overall main mix. Never before has such a level of control and customization been available for fine-tuning tones from the speaker section. For starters, the cab room is just that — a 3-dimensional speaker cabinet recording space that can be changed depending upon the desired “room” type and effect. Players can choose from a range of room types, from a cavernous “garage” to a full on cabinet “dead” room, and mix the room effect and color into the overall sound. 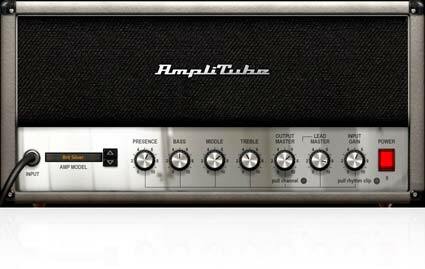 AmpliTube 4 welcomes 5 new classic amplifier models to the mix representing some of the best British tones from the 70s, 80s and 90s. Each amplifier has been modeled from scratch to embody a different aspect of powerfully classic British amplifier design: There’s the Brit 8000, Brit 9000, Red Pig, Brit Silver and Brit Valve-Pre. All of these new amplifiers have been created utilizing the same methods and patented technologies that have made the AmpliTube brand name synonymous with world-class sound, hyper-realistic tone and extreme accuracy. AmpliTube 4 is all about exploring new tonal possibilities and its new “Acoustic Sim” model pedal turns the electric guitar into a hyper-realistic acoustic. It delivers stunning realism and an amazing playing experience that can be tweaked with the onboard controls. Players can choose from and blend 3 acoustic body styles and 3 types of top material to sound like a full range of popular acoustic guitars. Now guitarists with AmpliTube 4 will always have at their disposal great acoustic sounds. Each track features standard treble, mid and bass eq, pan control, level, mute, solo and record enable functions, plus there’s an FX enable button allowing for application of different tone configurations to individual tracks. As a learning tool, you can import any audio tracks into the DAW section, define loop points and use AmpliTube’s built-in Speed control to slow down difficult passages without affecting pitch, and use the Pitch control to change keys without affecting speed. This feature is perfect for working out difficult solos or practicing different leads or melodies over a series of chord changes in a backing track. Rounding out AmpliTube 4’s new feature set is a MIDI controllable 4-track looper. Dubbed the Super Looper, it’s a full-featured intuitive 4-part looper that you can use to lay down multi-part backing tracks with speed and ease, then practice leads, chords and melodies over the top. Each track has an individual level and pan control so you can adjust them in the “mix” to suit your needs. You can activate each track with the click of the mouse, or use a MIDI foot controller like the iRig BlueBoard to activate/deactivate tracks. The looper audio can be exported to the hard drive of your computer, then imported into the AmpliTube DAW section, or your favorite sequencer. Audio backing material can be imported into the first loop channel for continuous play. The entire AmpliTube chain can be easily saved, organized and recalled through the advanced built-in preset browser. Presets can be tagged and stored using a series of searchable, user-defined keywords and attributes. AmpliTube offers deep, easy to edit integration with a range of controllers. Connect iRig Stomp I/O, IK’s revolutionary USB pedalboard controller and audio interface that lets you stomp effects, change presets, adjust settings and more, all with the feel of a traditional pedalboard. Or connect iRig BlueBoard and enjoy editable, wireless control over presets and effects. AmpliTube is also MIDI compatible so IK’s MIDI interfaces (like iRig MIDI 2) let you connect external controllers and associate patches or parameters with just a few taps. First and foremost, AmpliTube is all about the gear. AmpliTube 4 ushers in 5 new British classic amplifiers and cabinets, plus an acoustic guitar simulator, a double mic setup and the world’s most precise digital tuner — UltraTuner. In addition, AmpliTube 4 delivers the ability for you to swap out individual speakers in a speaker cabinet, a software first! Choose from 29 individual precisely modeled vintage and modern 12" guitar cabinet speakers. AmpliTube 4 welcomes 5 new classic amplifier models to the mix representing some of the best British tones from the 70s, 80s and 90s. Each amplifier has been modeled from scratch to embody a different aspect of powerfully classic British amplifier design. There’s the Brit 8000 (based on the JCM800), Brit 9000 (based on the JCM900), Red Pig (based on the Marshall Major), Brit Silver (based on the Silver Jubilee) and Brit Valve-Pre (based on the JMP-1). The new Brit 8000 is based upon the early 80s JCM800, the amp that although most think of the Plexi’s as the defining tone of a pushed Marshall, in reality it’s the JCM800 that people are hearing. The JCM800 was the first departure from the Plexi format designed for players who desired a “hotter” front end and more control over the overall output volume. The result? More preamp overdrive and crunch at controllable volumes. The Brit 8000 comes with matching cabinet 4x12” Brit 8000 which is based on Marshall® 1960 Lead Vintage 4x12 slanted cabinet loaded with G12-80 speakers. The new Brit 9000 is based upon the early 90s introduction of the “evolution” of the JCM 800, the JCM900. This dual channel, dual reverb head was designed for versatility with channel 1 voiced from clean to low level lead gain when cranked, and channel 2 voiced with enough gain to provide fearsome lead tones at low gain to screaming solo tones at high gain. The Brit 9000 comes with matching cabinet 4x12” Brit 9000 which is based on Marshall® 1960A Lead Vintage 4x12 slanted cabinet loaded with T75 speakers. This gem from the 60s is based on the Marshall Major 200 “Pig” (as it was nicknamed) made famous by players like Ritchie Blackmore, Jimmy Page, Joe Perry and at times Stevie Ray Vaughan. It was originally produced for players who needed more stage volume and sported a full 200 watts powered by KT88 power tubes. Nicknamed “the Pig” because it was a full 3” deeper than Marshalls of the day to accommodate the larger transformers, it quickly became the favorite of larger venue players. The Red Pig comes with matching cabinet 4x12” Red Pig which is based on Marshall® Major 4x12 slanted cabinet loaded with T75 speakers. Based on the 1987 Marshall Silver Jubilee commemorating the 25th anniversary of the Marshall company, the Brit Silver features the 3-gain mode of the preamp circuit “clean”, Rhythm Clip and Lead. The Silver Jubilee was also the first Marshall to feature an output power section that could be switched from full to 1/2 power, thus providing that JCM800 tone at reasonable volumes. The Brit Silver faithfully recreates the original Silver Jubilee down to every minute detail for hyper-real authentic Marshall tone. The Brit Silver comes with matching cabinet 4x12” Brit Silver and is Based on Marshall® 2551A 4x12 slanted cabinet loaded with T75 speakers. Rounding out the new Brit series of amps is a preamp model based on the Marshall JMP-1 valve preamp. The JMP-1 was Marshall’s first foray into the world of MIDI control with Marshall tone. It allows players to sculpt the tones they want, then save those tone presets for recall by MIDI control at any time. It's one of the most simple preamps, very straight forward. It has the staple Marshall controls like Volume, Gain, Bass, Middle, Treble and Presence. It features a bass shift, 2 overdrive channels, and 2 clean channels. For its ease of use and its “ready to go” sound character, it quickly became one of the most iconic Guitar preamps of the era. Almost 90% of the pro players at the time had a JMP-1 in their rack of toys. The Brit Valve-Pre comes with matching cabinet 4x12” Brit 30 and is based on Marshall® 1960A Lead Vintage 4x12 slanted cabinet loaded with V30 speakers. All of these new amplifiers have been created utilizing the same methods and patented technologies that have made the AmpliTube brand name synonymous with world-class sound, hyper-realistic tone and extreme accuracy. These models also bring a new level of realism and sonic accuracy through a new technology that precisely replicates the dynamic interaction between the power amp and the speakers, finally eliminating the “harshness” found in the upper frequencies of other software. AmpliTube 4 includes the Double Dynamic 57, a special mic setup based on a pair of Shure SM57 microphones. It can even be found in a typical setup used in the most sought after recording studios. It is made up of not one but two dynamic mics, one pointing straight and the other angled at 45 degrees. The phasing phenomenon generated by this setup produces pleasing high-frequency cuts, enhancing the boldness of the sound. But that’s not the coolest addition to the signal chain… now you use many of the stompbox and rack effects in ANY of the effects slots. Thanks to an innovative visualization feature and flexible routing options, you can now stick your favorite stompbox into the post-cabinet rack section or in the effects loop rack, or swap your favorite rack effects for a slot on the pedalboard. It’s a feature we’ve always dreamed of and now all our dreams have come true! Also stock in AmpliTube 4 is an upgraded tuner section with our patented UltraTuner technology — the most precise digital tuner available. UltraTuner delivers tuning accuracy down to 1/100th of a cent — so precise that it is more accurate than the “gold standard” mechanical strobe tuners. UltraTuner actually made it’s debut as an iOS & Android tuner and quickly became the go-to tuner for mobile musicians. Now it’s built into the first stop in the AmpliTube 4 signals chain. Multimedia “always open” 24/7 online gear store. In the Custom Shop, you can “try before you buy” gear from the top manufacturers in industry like Fender®, MESA/Boogie®, Ampeg®, Orange®, Soldano™, Groove Tubes®, Gallien-Krueger®, Jet City Amplification™, THD® and T-Rex®, Fulltone®, Z.Vex®, Carvin®, Morley®, Wampler Pedals®, Dr. Z®, ENGL® and more. In addition to these well-recognized brands, there’s also signature gear from artists like Slash and Jimi Hendrix. 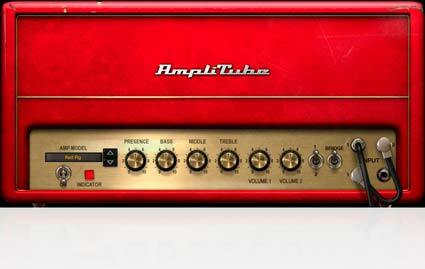 AmpliTube 4 can also be expanded with more gear via the Custom Shop. Owners of previous versions can restore all purchases and gear with the “restore my gear” feature in the Custom Shop. All told, there’s over 280 pieces of professional-grade gear now available for trial and purchase in the Custom Shop! As a standalone software and DAW plug-in, AmpliTube 4 comes with the gear listed. 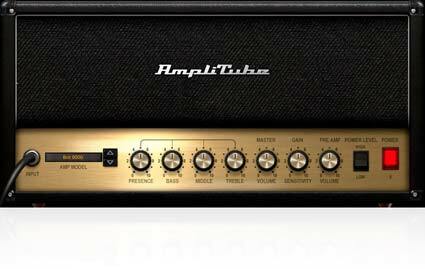 If you currently own a previous version of AmpliTube, you can use the Custom Shop feature to restore all of your gear from Custom Shop purchases and legacy gear. Below are all the gear models you can add to your rig through Custom Shop. This model is based on a traditional digital delay stomp pedal. A model of a classic bucked-brigade analog echo/delay (with modulation) stomp pedal effect. An iconic distortion pedal that has stood the test of time. Capable of tones from smooth sustain & compression to heavy buzz-saw distortion, this pedal is perfect for all different styles of metal. This model alters the sound of the input signal by changing the sample-rate, cutoff frequency and by distorting it. This effect can produce very aggressive distorted sounds, more pronunciated than overdrive stompboxes. The Low pass filter is very creative when combined to high distortion levels. A model of a classic overdrive stomp effect. First produced in 1978, this is one of the most versatile distortion boxes ever made. From subtle crunch to complete mayhem, this pedal has been used by countless guitarists of all styles. This hard-to-find vintage unit includes a built-in oscillator for infinite sustain. Hold notes to create amazing synth-like sounds or boost solos for more cutting tone, combined with classic distortion tones. A favorite of some of the heaviest bands of all time, the BOSS® MT-2 is perfect for extreme gain and sustain. Nothing compares to this pedal for pure distortion mayhem. This classic from the 80’s delivers deep, distorted crunch perfect for heavy metal and hard rock. Long-discontinued, this is a rare vintage find that delivers deep, dark crunch from the 70’s, 80s, and beyond. One of BOSS’s earliest and most collectible pedals, the SD-1 is one of the most aggressive overdrive pedals ever made. From subtle to over-the-top, the SD-1 pushes amps harder without sacrificing clarity and tone. This is a model of a classic overdrive/distortion pedal which has become the go to overdrive pedal for some of the most influential guitar players of all time. It's basic controls make it easy to dial in the exact sound you want. One of the most versatile distortion boxes ever. From smooth, light crunch, to extreme shred sustain and over-the-top gain, this pedal has been a classic ever since its release in the early 80s. This pedal is a model of a beloved 80's-era distortion pedal by a company known for making amps with amazing distortion. This model packs a whole powerful amp into a single stomp box. This effect is a model of a classic high end compressor. It is capable of mild compression or intense signal slamming, and does it all with a tremendous amount of finesse. This effect is modeled after a vintage compression stomp pedal. This model is a clean, highly effective 1 octave graphic equalizer, capable of fine tuning and dialing in that perfect tone. It is also very useful when you need to “push” the signal for the next stompbox or amp. This is a clean sounding 10-band graphic EQ. Useful for dialing in a range of different tones, or to boost the input to one of AmpliTube Metal’s amps for even more extreme distortion. This stomp is an advanced filter effect. It uses the envelope of the incoming signal to control a synthesizer style filter. It is capable of sounds ranging from very simple auto wah effects to extreme never before heard filtering effects. This complex stomp effect uses an LFO to modulate the frequency of its filter. With the included BPM sync this is a very useful effect for creating interesting, moving guitar parts with a minimum amount of trouble. A unique effect that can add synth-like drones and sustaining resonances to your parts. Make your guitar sound like a sitar or like a synth-drone to create sonic textures nobody will think has been done with a guitar. Set up the scale you want the resonances to sing on and control the notes with your controller to create arpeggios and steps while playing. A powerful and deep beat synced filter effect. Can apply Low / High and Band pass analog modeled filtering on freely customizable patterns to add groove and rhythmic pulsing to your parts. This will make your guitars and bass parts to sound like a rhythmic synth, if you want it! This effect is modeled after the classic wah pedal used by many of the top players from the 60's and 70's. In addition to the wah effect it also features an auto function, allowing it to be used easily without an external controller. This is a new exciting feature. This is a faithful rendition of a very sought-after wah pedal. Based on a multiple feedback opamp circuit, the pedal modeled here is a very expressive and unique wah pedal. The Wah 46 is a model of the most famous wah-wah used by Jimi Hendrix which became his signature sound in masterpiece tunes like “Voodoo Child.” Although the original had no auto-wah features, this additional functionality has been added for a more convenient usage when played on a computer. This is considered to be one of the best sounding wah-wahs of all time. This is an update of one of the most classic wahs of all time, heard on countless recordings from the 1970’s on. Jimi Hendrix used many fuzz box units like this vintage model which adds to the powerful sound palette that AmpliTube 3 can offer. This effect is modeled after a classic germanium transistor fuzz stomp effect. Typically used on lead guitar, this effect has remained a popular distortion effect throughout the years. This classic germanium transistor fuzz effect was the main fuzz box used by Jimi Hendrix. Often combined with a wah, this effect produced permanent sustain and endless distortion. The original Fuzz Face® is one of the most collectible fuzz boxes ever. This effect was first used on “Purple Haze” and “Fire.” It is a fuzz box with frequency-doubling circuitry that produces a second note an octave above the fundamental note. A highly sought-after, rare fuzz box, it was one of the first commercially available floor effect units, making its first appearance in 1966. It doesn’t get any more vintage than this when it comes to stomp pedals. One of the most flexible flangers ever made, the BF-2 delivers everything from classic tape flange to over-the-top sweeps, vibratos, chorus and more! Perfect for adding classic metal-style flange to your rig. This chorus is modeled after a classic Digital Chorus stomp box. A model of a classic bucked-brigade analog Chorus/Vibrato unit. It provides both analog Chorus and analog Vibrato effects, when in Chorus mode the modulation will be lush and slow, when in Vibrato effect the modulation will be faster and more noticeable. This stomp box is a model of a vintage flanger/filter matrix used by many well-known guitarists to achieve classic sounds. While it has amazing warmth, it is also capable of very versatile chorus and ring modulation type sounds. This stomp box is a model of a classic Flanger effect. A classic association with an iconic 80’s guitarist made prices erupt and flooded the market with reissues. Still, no flanger is more recognizable, making this perfect for hard-rock and metal tone. This model is based on a vintage Opto-Tremolo effect. This effect is one of the most popular phase pedal of all times. Used by a wide range of first-class guitarists, this unit could add a little bit of shimmer to your solos or generate a smooth, watery effect while playing chords and muted strumming. Try the Phaze Nine on bass, keyboards or vocals. A model of a classic analog multimode Phaser stomp box. This effect is a model of a classic analog phase shifter, capable of a range of phaser effects from gentle to outlandish swirling effects. You may wonder why it is called "small" when you hear it. This was a chorus/rotating-speaker simulator that was introduced in 1969 and used predominantly in live performances. This created a swirling effect quite similar to the Leslie® speaker cabinet but with the addition of speed control. This effect was employed on tracks such as “Hey Baby (The Land of the New Rising Sun),” “Earth Blues,” and “Machine Gun.” A vintage Uni-Vibe™ is in such high demand it sells for over a thousand dollars, if you can even find one. This effect is a 3 voice digital harmonizer effect. More than just a pitch shifter, this pedal will create 3 separate harmony voices with independent interval values based on a musical scale. Simply select the scale to use, select the voice and the desired pitch and play. The harmonized notes will be according to the selected scale. This stomp effect is modeled after a classic dual voice octave pedal. It will produce two additional sounds, one and two octaves below the direct signal. This effect shifts the pitch of the incoming signal. This new pitch shifted signal is blended with the original sound to create harmony guitar leads or other types of dual pitch effects. One of the most extreme effects of all time, the original Whammy is a costly vintage find these days. From classic shred to the most aggressive modern metal, this is an essential part of any extreme guitar rig. This model is a traditional volume pedal. Add programmed rhythmic parts to your power chords and phrases with this powerful and creative beat synced slicing effect. Can be setup to create anything from the most amazing tremolos to the most complex rhythm effects that always stay in perfect sync with the beat. This is an "auto volume" swell processor that can automatically create fantastic swell effects while playing without any manual intervention. Use it subtly to add groove to your rhythm parts or use it with deeper settings to create dreaming pads or string-like sounds. This virtual stomp effect emulates the Ampeg SCP-OD Overdrive pedal. It recreates the original distortion circuit, adding upper octave harmonic content to the direct signal and creating as a result a unique overdrive effect. This stomp effect is modeled after the Ampeg SPC-OCT Octaver pedal. Moving the octave knob will double your direct signal one octave below the direct signal. In this way you can make your melodic lines richer and fuller, expanding the frequency range. A model of a classic analog Chorus/Vibrato unit provides both analog Chorus and analog Vibrato effects. When in Chorus mode the modulation will be lush and slow. When in Vibrato effect the modulation will be faster and more noticeable. This model is based on a classic analog delay with modulation stomp pedal. This effect is modeled after the classic Wah pedal used by many of the top players from the 60’s and 70’s. The "auto" option will produce the Wah effect automatically, meaning that there is no need for the manual intervention on the pedal position. This effect is modeled after a vintage compression stomp pedal and can deliver a strong sustain and powerful compression with lots of character. This stomp is a highly developed filter effect. Essentially, it uses the envelope of the incoming signal to control a synthesizer style filter. The sound palette’s range of this virtual unit is wide and rich. 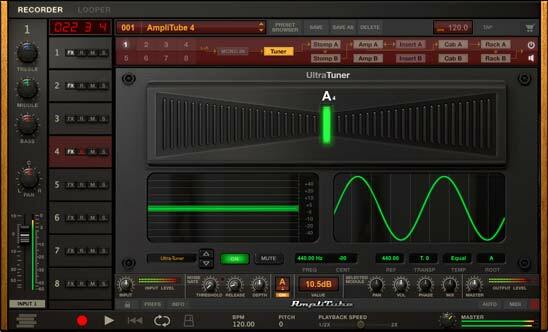 You can enhance your bass tone adding from simple auto Wah effects to extreme filtering effects. A unique germanium fuzz/distortion pedal. With a tone unlike any distortion pedal on the market, the Blender™ is capable of a harsh fuzz effect, great as a tool for Psychedelic and Alternative Rock. Perfect for those who want to create instead of copying, with a bit of experimentation, this pedal can deliver a huge range of unique tones. A classic volume control. Use to control the volume of your guitar signal, or in conjunction with an overdrive/distortion pedal for dynamic control of your signal boost. A combination of a Fuzz-style distortion effect and a Wah pedal, this is two pedals in one. Due to this combination, and its Fuzz>Wah / Wah>Fuzz selector switch, the Fender Fuzz Wah is capable of effects not easily achieved by traditional units. A Classic analog Phase shift effect as heard on countless recordings since the 1970s. The rate control knob alternately illuminates blue and red at the same rate as the phase shifting. Now add that famous Fender® Amp Tremolo sound to any Fender® amp, or any other "Powered by AmpliTube" amp model using X-GEAR. Based on the classic Fender® tube tremolo circuit, you can adjust the speed and intensity to perfection, and add this classic effect to any amplifier setting. BPM sync function allows for automated effect syncing to your DAW tempo, or set your tempo manually to add that dramatic tremolo sparkle or darkness to your tracks. Two distinct wah voices give this model a huge range of "wah-ptions." Switch between the traditional "Cryin'" sound, or the famous "Clyde McCoy" inspired sound, both from the same pedal. Adjust your effect frequency range with the minimum and maximum knobs, and control the amount of effect applied with the "wah" control and volume level knobs. A very inspiring pedal that will also add dramatic effects to your bass lines. First introduced in the early 1960s, this classic all-tube spring reverb unit is a must have accessory for all Surf players. Blues and experimental players love it, too. It’s presented here in stomp-box form instead of its original head-style unit. The Fender Reverb is capable of producing an incredibly lush or intense crashing Reverb effect due to its post-guitar, pre-amplifier signal path and unique tube driven output. A classic tape echo simulation, as seen in the Fender® Cyber-Twin®. The warmth and wobble of magnetic tape lent a wonderful ambience to the echo effects used on recordings of the last 50 years, and those sounds can be recreated easily with AmpliTube® Fender®. The Tape Echo’s controls can also be manipulated for experimental lo-fi echo effects, bringing extra creativity to your playing. Now get the Fender® Cyber-Twin® SE inspired compressor in a stomp box. Increase your signal gain before it hits other effects and amplifier, or use it elsewhere in your pedalboard chain to create dramatic "attack" effects. The Fender® Stomp Compressor has four detented potentiometer positions for varying degrees of gain boost and compression. This creative delay effect unit can be used to create interesting and unusual delay effects thanks to the 8 totally independent taps. You can create grooving rhythm patterns by combining more taps with a specific time signature, and you can mix this up with psychedelic reverse tape effects you are able to set for each tap. This effect is based on Musitronics Mu-Tron® III Automatic Wah from 1972. It became famous through its use with keyboards. Filters allowed for low-pass, bandpass, and high-pass filter response which could be triggered from low to high frequency or vice versa. The T-Rex Møller is a unique overdrive pedal that creates a wide variety overdriven tones with flexible tonal control along with a separate transparent 0-20 db adjustable and switchable clean boost and a special option to mix overdriven and clean signals. The Møller was developed in 2003 for a well known Danish guitarist named Knud Møller who wanted a tube screamer but with an added clean boost. T-Rex made the custom pedal based on the Alberta and subsequently named the Møller pedal after the guitarist. The T-Rex Mudhoney is designed for those looking for an in-your-face wall of sound jumping out of the speakers. The boost button and the tone knob give you the ability to dial in any sound you like from ultra fuzz to smooth jazz sounds. With the boost function bypassed, the Mudhoney delivers moderate gain and a rich, smooth sound that many jazz guitarists prefer. The boost button engages a high gain circuit for a more aggressive sound. The T-Rex Replica is possibly the world’s best delay pedal. With its astonishingly warm tone it is the perfect mix of controls that delivers everything the most demanding guitarists could ask for in a delay. The Replica is used by guitar heroes from Pete Townsend to John Mayer to deliver their classic sounds. This amazing stomp box reproduces the hypnotic, pulsing tremolo sound characteristic of ‘50s tube amps. It can also produce crazy and innovative tones never heard before. With its detailed "Wave" and "Shape" controls, it is one of the most versatile tremolo stomp boxes available. The Wave control shapes the tremolo effect from a smooth sine wave to a sharper triangle wave to the abrupt “on/off effect” of a square wave. The Shape control sets the rise and fall time of the tremolo (how fast or slow the volume increases and decreases). This adds some very different variations to the tremolo effect: with a quick swell and a slow drop, the effect is percussive like a piano. Conversely, with a slow swell and a sudden drop, the result is reminiscent of a tape played backwards. The Power Grid is a high gain, solid state distortion pedal capable of a myriad of tones thanks to a three-band active EQ section. It is perfect for all styles of rock. The pedal is designed to provide powerful overdrive and distortion suitable for all kinds of rhythm and lead playing thanks to five stages of discrete Class A circuitry. This raw horsepower is managed by a multi-element gain and volume control system that provides very fine control. The tone is further refined with three bands of active EQ. Each band allows for up to 12dB of boost or cut at selectable frequencies for maximum control. This allows you to create tones with a far greater degree of surgical precision than what’s possible with any distortion pedal with a traditional passive EQ. The booster stomp box used by Slash. It boosts your signal up to 20 dB. It's perfect for solos, punchy rhythm parts or to drive effects harder for more dynamics and sensitivity. The chorus stomp box used by Slash offering great control and flexibility. Used in one of the most famous song in the history of Rock: Paradise City. Use this stomp box with Clean/Crunch settings to add shimmer and moving modulation to arpeggios or chords. The Fuzz/Octave stomp box used by Slash. Adds fuzz to your signal and then duplicates it two octaves down. This is one of the most evil and vicious pedals! The gate stomp box used by Slash. It gates out noise slowly when notes are being held and quickly when they are stopped short. Three filter cut-off points are available: Hiss, Mid, or Full Band. The digital delay stomp box used by Slash. Based on one of the most famous modern digital delays. Use this effect to add space and repetitions to your parts. The wah pedal with integrated distortion used by Slash. One of the most classic wahs combined with powerful high gain distortion. Very useful on rock solos to add expression and bending. One of the most versatile yet modern sounding wah pedals. Thanx to its array of controls it can be tweaked to suit many styles and sounds; the Contour and Level controls allow to fine tune the high end response and personality of the pedal from mellow to bright and cutting, while the Auto-off feature adds tremendous flexibility to the pedal’s functionality. Works with Bass guitar too! The EP Tape Echo is the gold standard of vintage tape-echo units. Hendrix liked experimenting with it to produce wild psychedelic effects in the studio, and he used it heavily during the recording of Electric Ladyland. A wah with a 4-, 6-, or 8-step analog-style sequencer in it, featuring LEDs that light up to show the steps. The speed control governs overall sequencer tempo, and the 4-6-8 switch governs the number of steps. This pedal produces rhythmic-pattern wah sounds that are totally unique. Seek Trem is a tremolo pedal combined with an adjustable 4-, 6-, or 8-step analog-style sequencer. Each step has a volume knob so that you can turn it up or down in the pedal’s output, giving you complete control over the rhythmic pattern, and allowing for ultimate creativity. There’s also a knob for adjusting the pattern’s overall speed. An overdrive pedal that provides the same kind of touch sensitivity and complex harmonics that you’d get from a quality tube amp. Volume, Tone, and Drive controls let you dial in the perfect sound for your song. Take your overdriven tones to a new level with OCD. As the name implies the Wampler Nirvana chorus pedal is geared towards eerie and ethereal sounds . On top of the "standard" chorus controls (Depth, Rate, Level) this pedal has a two selectors which allow to switch the chorus to vibrato (the Vib. switch) and to control the intensity of both voicings (be it chorus or vibrato) with three different levels of depth, so that the dedicated Depth knob will have a more precise action. The Tone control fine tunes the color of the modulated part, a feature which is missed on the majority of pedals. Based on the eponymous pedal from the Wampler brand the Pinnacle Deluxe captures the original "Brown Sound" of the early plexi-style amplifiers pushed to the limits, a sound that was the trademark of many rock guitarists of the late '70s and early '80s, Eddie Van Halen to name just one... It features a dual gain stage mode: it can act as a mild overdrive to push the following amp into distortion, or via the "Boost" switch it can generate a thick amount of distortion on its own. The "Tone" knob covers the overall brightness of the distortion, while the "Contour" knob takes care of the critical midrange, allowing to scoop mids out or push them forward according tho the rhythm or lead duties it's called to serve. Based on the Dunlop® Cry Baby® GCB95. Modeled with precise attention to Dimebag Darrell’s lead tones. Based on an MXR® Flanger Doubler, this model offers two effects in one. Primarily used by Dimebag Darrell in “doubler mode” to thicken in his overall tone. AmpliTube has always been about realism, and now that extreme commitment to accuracy is a part of its completely redesigned cabinet section. The new Cab Room feature is the most advanced cabinet section ever made, giving you a new level of customization and flexibility never before seen in software or reality. The cab room now has 5 distinct customization sections: cabinet selection with size adjustment where you can choose the speaker cabinet you’d like to match to the amplifier, individual speaker selection where you can swap out individual speakers, mic selection and placement for finding the speaker “sweet spot”, room selection where you select the recording environment, and a mixer section that allows you to control and mix the levels of speaker mics, room ambience, direct amp signal and overall main mix. Never before has such a level of control and customization been available for fine-tuning tones from the speaker section. AmpliTube 4 ushers in some amazing control features when it comes to fine-tuning and tone sculpting one of the most important components in the signal chain: the speaker cabinet. First, it lets you mix and match speaker cabinets with the amplifier you’re using. Choose the cabinet that’s most commonly used with the amplifier, or select a completely different cabinet from all of the available models. This allows you to do some things you simply can’t do in the physical world — break up combos and use the individual cabinets from them. 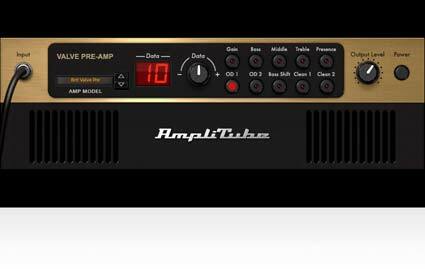 Plus you can use any available cabinet with any amplifier — impedance matching in AmpliTube 4 is automatic so you never have to worry about blowing up your power amp! Pretty sweet. Want to hear what a Vintage 30 sounds like next to a Greenback? No need to get the drill and soldering iron out, AmpliTube 4 lets you swap out individual speakers with the click of a button! AmpliTube 4 comes with 29 precisely modeled speaker emulations of some of the most popular speakers in cabinets today, with more available in the AmpliTube Custom shop. Now you can experiment with different speaker combinations to sculpt that perfect cabinet sound, all in the convenience of your personal recording space. But what makes the new cab room even more realistic is the fact that it not only picks up the tonal character of the individual speakers, but it replicates the harmonic and physical interaction that occurs naturally between the speakers giving you the most realistic sounding environment available. In short, you can go hyper — hyper real with mic’ing up a cabinet! Imagine having access to 18 of the most coveted recording microphones of all time. Now imagine being able to choose and place those mics exactly where you want them — right in the “sweet spot” that truly evokes the range and emotion you want to express. Now you can. AmpliTube 4 comes with 3 highly coveted recording microphones and there are an additional 15 mics available in the AmpliTube Custom Shop. AmpliTube 4 gives you the choices and ability to go hyper-real with your mic placement. And AmpliTube 4 not only picks up on the tonal characteristics of the individual speakers, but it actually picks up the physical and harmonic interaction between the individual speakers, surrounding cabinet and space between the speakers and mics. With AmpliTube 4, you’ll quickly realize what you’ve been missing with other amp sims. Want to record in the garage? How about in a hardwood studio room with a rug? A cabinet isolation room? With AmpliTube 4, now you can. The Recording Room selection tab lets you choose from 6 different ambient recording spaces. Choose from a big live room, venue stage, two studio rooms, an isolation booth or a garage. You can also select which pair of room mics you want use and then dial in the amount of stereo room ambience to your liking. The Recording Room selection adds a completely new level of hyper-realism to your guitar tone. AmpliTube 4 now has a dedicated mixing environment for the speaker cab room. Now you can custom mix all of the audio components in one easy to use mixer — speaker mics, room mics, direct amp signal (that’s right… you can even blend a little DI into the mix!) and control the entire volume level with a master fader. Never before has it been so easy to get hyper-real! AmpliTube works seamlessly with your favorite DAW as a plug-in, comfortably playing well with other plugs in the mix. But what if you don’t want to fire up the giant recording beast just to get a few ideas down quickly? Well, you’re in luck. AmpliTube 4 also operates as a standalone guitar & bass tone studio AND idea capturing 8 track recorder and DAW. This means several things… First, you can just hit record and start wailing as the tone inspires you. The quickest way from brain to ears is the push of one button and WHAM — there’s your phrase in all its splendor. Need to add a layer? Bass? Drone riff? No worries, you’ve got a full 8 tracks of space. 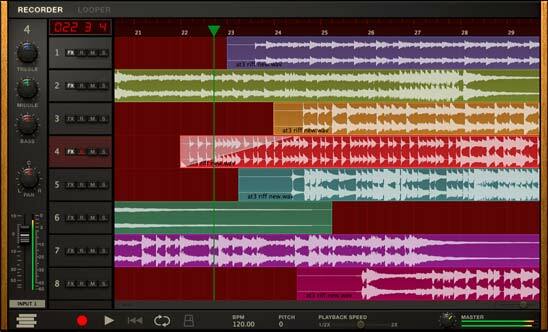 And with the new DAW section, you can do some other pretty nifty tricks. Manipulating audio in the DAW couldn’t be easier nor more intuitive. Audio waveforms accurately represent your recordings for precise editing. Each track features your standard treble, mid and bass eq, pan control, level, mute, solo and record enable functions, plus there’s an FX enable button allowing for application of different tone chain configurations to individual tracks. Add a crunch rhythm to track 1, clean shimmering chunk chords to track 2, layer overdrive and heavy tones on 3 & 4… anything is possible in AmpliTube! As a learning tool, you can import any audio tracks into the DAW section, define loop points and use the built-in Speed control to slow down difficult passages without affecting pitch, and use the Pitch control to change keys without affecting speed. This feature is perfect for working out difficult solos or practicing different leads or melodies over a series of chord changes in a backing track. Want to hear a passage at a different tempo or pitch? Simply use the speed & pitch controls to adjust. AmpliTube 4’s DAW can do it all! AmpliTube 4 lets you export your masterpieces however you see fit… as individual tracks or as one master file for mastering — the choice is yours. And you can export in a variety of file formats to suit your needs, .wav, .mp3,. .aif and more. Speaking of Loops, AmpliTube 4 now sports an intuitive 4-track looper that’s an improvisationalist’s (is that even a word?) dream come true. No more outboard gear for looping and practice… it’s all built in! The 4-Track Super Looper may look simple, but in hyper-reality (just like everything in AmpliTube 4) there is some pretty powerful stuff working under the hood. The first thing you’ll notice about the looper is you have 4 tracks. The cool thing about these is that there’s really no limit to how long you make your loops. Recording time is limited only by the amount of disk space you have on your computer. However, the loop length for loops 2, 3 & 4 are set by the start & stop recording time for track 1. Just makes sense. Each track has an individual level and pan control so you can adjust them in the “mix” to suit your needs. You can activate each track with the click of the mouse, or use a MIDI foot controller like the iRig BlueBoard to activate/deactivate tracks. You’ll notice a metronome icon at the bottom of the window. Here you can activate a click track for the looper and set your tempo. Once activated, the click track gives you a 4 count “count-in” and you’re ready to make your next hit phrase. The 4-Track Looper also lets you export your loops, reopen into the built-in DAW, or import them into other sequencers. The Super Looper lets you do amazing, hyper-realistic things inside the world of AmpliTube 4.